Well, bad news. I came home from work tonight and all the babies are gone. I'm guessing the female must have eaten them, because they are nowhere to be seen. I was afraid something like this would happen. Usually when the female is ready to spawn again she will eat the fry, even though it's only been about a week and a half since she must have laid the eggs. Either that or since it was her first spawn to hatch maybe she just doesn't know better yet. 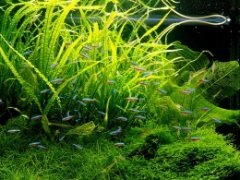 Some other aquarists have pointed out that usually the male is the one who takes care of the fry once they've hatched. It's kind of odd that the female even took care of them at all, so maybe that's why they are gone. Maybe she killed the father? He didn't look very beat up, so who knows.